Poker is a game of many skills and to become an expert poker player you need to master them all. This includes concepts such as hand selection, position, proper image projection, and reading hands. However, there are many players who have mastered most of these skills yet they still do poorly in the games -- at best they are only small winners. And when they step up in limit and challenge the better players, they almost always fail. You see, knowing the concept is one thing, putting it all together is another. As the text will show, winning poker is a process that requires a lot of thinking as well as a thorough and systematic approach to the game, and that is what this book is about. 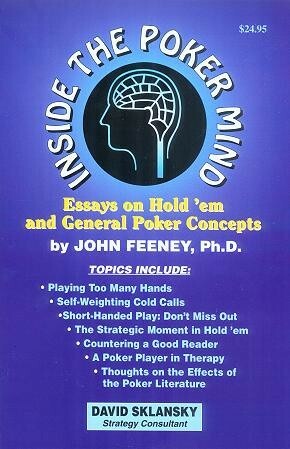 Topics include Playing Too Many Hands, Self-Weighting Cold Calls, Short-Handed Play: Don't Miss Out, The Strategic Moment in Hold 'em, Countering a Good Reader, A Poker Player in Therapy, and Thoughts on the Effects of the Poker Literature. Those of you who are serious about your game should find much of this material to be extremely valuable.